A Preacher Curl is, and can best be described as follows: A Preacher Curl is a free weight bench designed to assist in performing Biceps curls by placing the user in a seated position with the elbows resting on a sloped and sometimes curved pad. 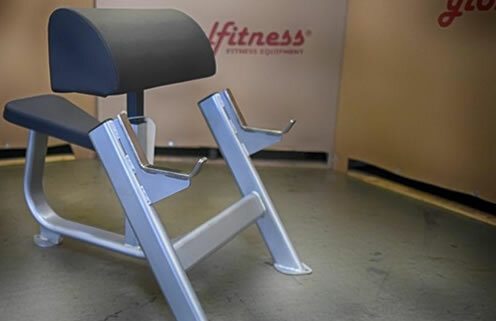 The preacher curl bench design provides an isolated movement pattern, thus increasing the effectiveness and difficulty of the exercise. While holding dumbbells or a barbell, the weight is moved through an arc by the contraction of the Biceps muscles in a curling motion.